In the 1970s, an environmental awakening spread through American society and resulted in much of the landmark legislation – the National Environmental Policy Act, the Clean Air Act, and many others – that define our current system of environmental regulation. While additional protections have been added, much of environmentalists’ struggle in the decades since has been focused on maintaining this high-water mark and ensuring that regulations are implemented in an environmentally protective fashion. 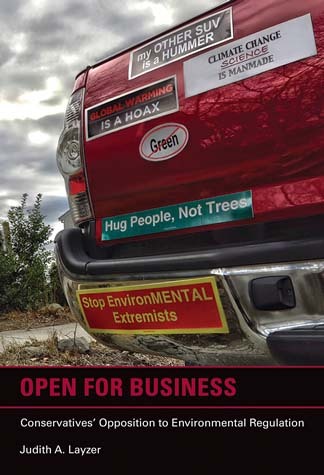 But as Professor Layzer details in her book, Open for Business: Conservatives’ Opposition to Environmental Regulations, American environmental protections have been the target of a decades-long assault that threatens to drastically reduce their effectiveness. A conservative, anti-regulatory movement has grown dramatically in response to the implementation of environmental laws. Opponents of environmentalism, fearing the effect of regulation on business and the economy, and distrusting the Federal government, have slowly build a case against environmental protection. While they have not overturned any major pieces of environmental legislation, they have been very effective in influencing the way regulators exercise discretion in implementing environmental rules. Perhaps more significantly, they have made environmentalism a controversial issue and shifted the popular image of the Federal government from one of protector against industrial excesses to a heavy-handed opponent of private enterprise. Professor Layzer’s book details the growth of the conservative anti-regulator movement over the course of the past few decades, and illustrates many of the tactics and actors involved in provoking the backlash against environmentalism, both at the elite and grassroots level. Open for Business is available through the MIT Press. Posted on April 16, 2013, in environmental policy and tagged anti-regulations, legislation, regulation. Bookmark the permalink. Leave a comment.